Devcon epoxy adhesives cure and join things together by a chemical reaction between the resin and hardener. The reaction results in high strength non-flexible bonds that are resistant to most chemicals. Use Devcon epoxy adhesives for household, industrial, crafts or any job that requires a high-strength, high-quality bond. All purpose clear drying epoxy best used on metal, wood, concrete, glass, china and ceramics. Devcon 5 MINUTE EPOXY: # S-205 Two part. 1 oz. tubes. Working time: 5 minutes. Handling time: 15 minutes. Resists water. Devcon 5 MINUTE EPOXY: # S-208 Two part. Dev-Tube syringe. Easy flow syringe. Snap open cap. Reseals for storage. Net vol. 25 ml. Devcon 5 MINUTE EPOXY: Two part. 9 oz. Kit. Easy to use plastic squeeze bottles. All purpose epoxy that dries clear. Best used on metal, wood, concrete, glass, china, ceramics and fiberglass. Working time: 30 minutes. Handling time: 2 hours. PSI strength 2500. Devcon 2 TON EPOXY: # S-31 Two part. Dev-Tube syringe. ATTACK Dissolves cured epoxy & polyester resins. 8 oz. can. from metal, stone, glass or wood. Vapor harmful: contains methylene chloride. DuPont DUCO CEMENT 1 oz. tube. plastic, wood, metal and crafts. Dries clear and fast - non-flexible. For watch crystals, hobby/craft and industrial uses. of cement to be applied to intricate parts for exact placement. Will not bond fingers. Dries clear - flexible. Industrial strength, multi-purpose self leveling formula adhesive. Clear - Abrasion resistant - Waterproof - Paintable - flexible. 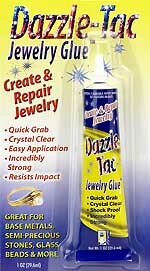 An extra strong, permanent glue for base metals, semi-precious stones, glass, beads, bone, mirrors, wire, mosaics & more. Convenient nozzle tip for precise application. Quick grab for immediate hold; always flexible and never brittle. Dries crystal clear; water proof and UV resistant for greater durability. Superior impact resistant formula so that stones and findings stay put. Use sparingly as a little Dazzle-Tac goes a long way. High industrial strength rapid bonding adhesive. Non-flexible Alpha cyanocrylate. 20-40 second setting formula. Medium viscosity. Suitable for rubber, plastics and metals. ARON ALPHA Type 220 Super Glue - 2 Gram squeeze tube. ARON ALPHA Type 220 Super Glue - 20 Gram squeeze bottle. and heat and is water resistant. Devcon PLASTIC STEEL is a high strength epoxy that dries a metal flaked black. Best used on copper, steel, aluminum, stainless steel, brass, iron and pewter. When it dries, it can be sanded, drilled, tapped and painted. Waterproof. Working time: 60 minutes. Handling time: 6 hours. PSI strength 2500. Often used as a backing for turquoise cabochons. Devcon PLASTIC STEEL: Two part. 1 lb. Kit. Pour able. Devcon METAL PATCH & FILL (Liquid Aluminum) 3 oz. tube. It dries grey and can then it can be sanded and painted. It is often used to set channel inlay stones in silver as an adhesive and hide any gaps.